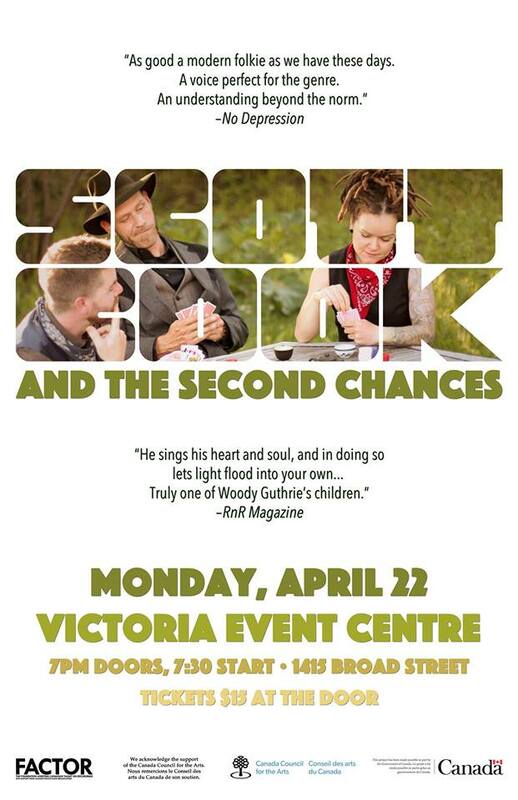 A roots balladeer with a rare personal warmth, Edmonton’s Scott Cook (www.scottcook.net) has distilled the stories collected over twelve years of steady touring across Canada, the USA, Europe, Asia, and Australia into straight-talking, keenly observant verse. In 2017 he released his sixth studio album, Further Down the Line, with longtime collaborators The Second Chances: Bramwell Park on banjo, mandolin, and harmony vocals, and Melissa Walker on upright bass and harmonies. The album earned Cook his second Canadian Folk Music Award nomination (English Songwriter of the Year), and comes packaged in a 132-page book containing a look back, in words and pictures, on his last decade of near-incessant travel. Cook is one of the hardest-working troubadours on the road today, averaging over 150 shows and a dozen festivals every year since 2007. All the hard miles notwithstanding, he still believes that songs can change your life, and your life can change the world.